Distance education or Distance learning or Online Learning is a field of education that focuses on teaching methods and technology with the aim of delivering teaching, often on an individual basis, to students who are not physically present in a traditional educational setting such as a classroom. It has been described as "a process to create and give access to learning when the source of information and the learners are separated by time and distance, or both." Distance education courses that require a physical on-site presence for any reason (including taking examinations) have been referred to as hybrid or blended courses of study. Learn any time, any where: The biggest advantage of an online course is that your virtual classroom will be available to you 24 hours, a day, and seven days a week. A new learning experience: No CD ROMs! Our online courses and syllabus are help you to guide and learn. Save on travel and time: Online courses allow you the chance to spend more time on training and less time in traffic! 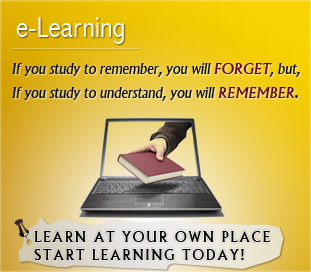 Enhanced learning: Online courses will help you to learn all kind of courses. Improve your life skills: Learning via the Internet opens up a world of possibilities for your personal and professional life by improving your skills in using technology! Document your progress: Online learning allows you to revisit the course content, documents, and discussion forums as often as you like. You never miss a thing in an online course.